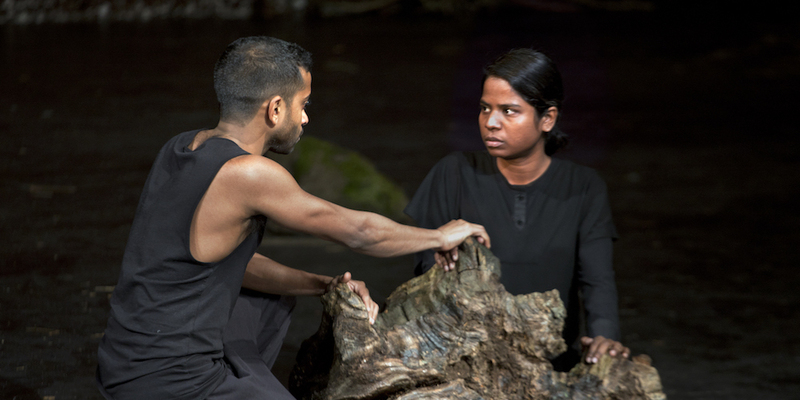 Peter Brook and Marie-Hélène Estienne, The Prisoner. Performance view, Theatre for A New Audience, Brooklyn, 2018. Hiran Abeysekera and Kalieaswari Srinivasan. Photo: Simon Annand. British director Peter Brook has been a gale force in theater for well over half a century. From his legendary nine-hour adaptation of the ancient Indian war epic, The Mahabharata; to his work with countless acting luminaries such as John Gielgud, Paul Scofield, and Glenda Jackson; to his founding of the International Centre for Theatre Research at the Bouffes du Nord in Paris, France; to his award-winning works for film and television, he has, in essence, devoted his life to mastering the craft of storytelling. Although he is ninety-three, his passion for theater is no less fiery than it has always beenhis ideas still invigorating, challenging. His latest play, The Prisoner, devised with his long-time collaborator Marie-Hélène Estienne, is based on a singular and haunting story from Brook’s own life, and is being performed at Theatre For A New Audience in Brooklyn, New York, through December 16, 2018. FORTY YEARS AGO or so, I was in Afghanistan with my wife and some close friends, and while I was there, I was accepted into a very intimate Sufi circle. The teacher was a very modest young man, and when I told him it was time for me to return home, he said: “If you’re going South, before you come to Kandahar, you’ll see a little dusty dirt track. Turn up there and go on for a couple of miles. You’ll see a state prison, and a young man sitting there. That young man was part of our group. I know him, and I know he had great qualities in him, but I never discovered what terrible crime he committed. I asked the judge, who was also part of our circle, if rather than putting him in prison, he would sentence the man instead to sit and face it, and he agreed.” A short time later, we took the dirt track, and saw the man sitting there. The impression I had of him was one of real strength. In his eyes, I saw the inner workings of the process of redemption. It was something I’ve never seen before. He was eating and he offered to share his meal with me, but I hadn’t the courage to take it so I said “no thank you,” and left him. Ten years later, I went back and everything had changed, so I never knew what became of him. I don’t think there’s any other case of a man sentenced not to go into prison, but to sit and face it, which meant that the terms of his punishment were in some sense up to him. He could have gotten up at any time and said “I have now been punished enough.” Somehow this has always been a story that wemy collaborator Marie-Hélène Estienne and Ifelt needed to be told, almost as homage to this unknown man who did this unique form of penance. Peter Brook on The Prisoner, 2018. There is no moral to The Prisoner, no conclusion. Not that ghastly thing called “a message.” When people ask me what I am trying to say, I get very angry. I’m not trying to say anything. If the play touches you, perhaps you’ll carry away something in you that makes you ask: “Where is the prison?” And perhaps gradually, one will discover that the prison is within oneself, and that all of uswhatever we have learnt, whatever we are made up ofare prisoners of something. None of us are free. That is not a negative thing; it’s an incentive to push ourselves farther. I’ve done work in prisons for a very long time. In 2016, we were in New York performing Battlefield, and we visited the women’s prison on Rikers Island. We were introduced to about twenty women who had a Stella Adler drama group that would meet regularly. All the women in this group were serving long sentences. And though we never asked, some of them told us what crimes they’d committed. We decided to perform a little fragment of our play for them, and in one of its first lines, the word “justice” is spoken. You could feel something throbbing amongst all these women when they heard one of the performers say “what is justice?” These women lived with that question every day. As we talked together, they told us of a story they wanted to work on amongst themselves, so we started improvising. That was a tremendous experience. A theater artist will experience greater freedom if they can just say “this is storytelling,” and for great storytelling, you just need to catch the imagination. In a very icy part of the north, when winter comes, I know that there are families who have prepared food throughout the entire summer so they need never go out into the snow and ice. They’ve got logs enough to heat their home, and the they spend four cold months all together. And one of them, an uncle usually, assumes the job of preparing a storya serialthat could last all winter. He has to write the story so that at the end of each episode, everyone asks, “And then what?” And he’ll respond, “Wait. Tomorrow.” And that to me is pure theater: the sharing through the imagination of something down to earth and concrete and appealing for the imagination, so that there’s always that sense of “and then what?”that sense of wonder, which one needs so badly, and one has so little of in everyday life.